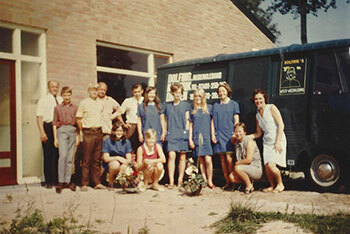 Dolfing Druten is a true family business with a rich history and a wealth of experience. This history dates all the way back to 17th May 1919 in Emmen. This is when Jan Dolfing first started his tailoring business. He transferred his knowledge, enjoyment and quality work over to his son Geert Dolfing in 1945, after moving to Kamerik. The company in Druten expanded under his management and the knowledge and quality continued to grow. Grandson Peter Dolfing added his perspective and experience in 1977 and eventually passed over the reins to the fourth generation in 2013: Geert Dolfing jr. So what’s changed over the years? The buildings, the people and the machines. What has remained? The distinctive technology of water- and airtight welding and the love for the trade. This is still very evident in every small detail, both in the clothing as well as the contact with us. 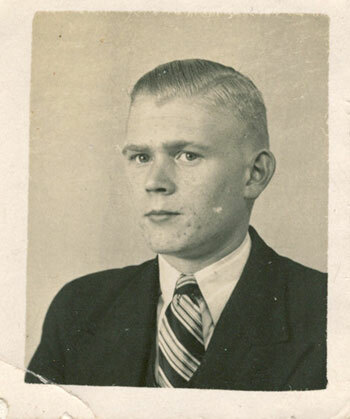 Jan Dolfing married Lubbigje Vrijhof and started his tailoring business on the same day – 17th May 1919. 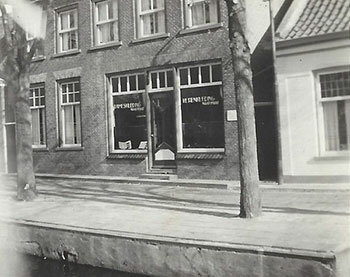 Located on Kapel Street in Emmen, his first major client was the Warrink company. Great-grandfather to Geert Dolfing jr, Dolfing Druten’s current owner, Jan Dolfing moved his business from Emmen to Kamerik in the Province of Utrecht in 1934. Not such a great distance in today’s age of luxury cars, but in 1930s such a move was a major undertaking. Economic prospects in the west of the country seemed a better bet for a tailor hailing from Drenthe. Even in those times of scarcity, and as an immigrant from the east of the country, Jan Dolfing was able to build up a good name for himself and raise enough income to feed his family. 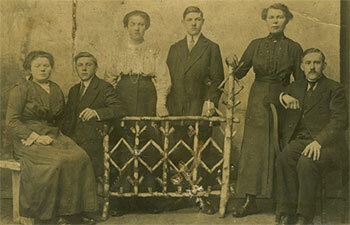 Upon his death aged 46, his wife, Lubbigje Dolfing-Vrijhof – a widow with eight children – led the company on from 1936. Jan’s eldest son, Geert Dolfing, took over his mother’s clothing firm in 1945, aged 25. The European economy was steadily recovering in the aftermath of the Second World War. The rising prosperity was due in part to the unwavering pace of industrialisation, to which the Netherlands was no exception. Clothing products became mass-produced, and while the young custom tailor Geert Dolfing found that his customers were now more inclined to refresh their wardrobes than before, they preferred off-the-peg garments. The focus began to shift from making clothes to repairing and adapting them. Geert Dolfing found a good customer in the Department of Defence. He concentrated on producing military workwear that was hardly fashionable, but met their high functional requirements. This also led him to specialise in using glues and tape to create a watertight coating for overcoats and other garments. The rapid industrial build-up of the fifties and sixties led to a steady stream of innovations; the development and application of new materials rose sharply. The fifties saw the introduction of cloth that remained flexible while being fully watertight thanks to a synthetic polyvinyl chloride coating. Another new invention in electrical engineering, known as high-frequency welding, made it possible to fuse the new materials together to be watertight. The purchase of the first high-frequency welding machine on 26th February 1958 marked the beginning of a new chapter in the history of the Kamerik-based clothing firm. That moment heralded the start of a modern rainwear factory as well as the build-up of know-how that serves Dolfing today. The sixties saw the rainwear factory in Kamerik grow to thirty staff, naturally making a name for itself with major clients along the way. Some of them are still our rainwear customers today, as these product lines have never lost their reputation as indestructible. In the late sixties the Netherlands was struggling with staffing shortages, particularly in the west, but demand for Dolfing’s watertight clothing range only continued to grow; even in those times, there were still workers to be found in and around Nijmegen. 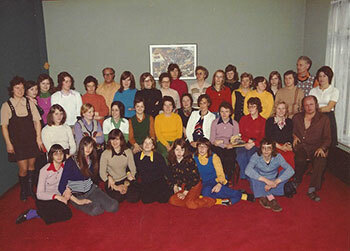 Geert Dolfing therefore decided to build a second facility in Druten, which began production on 15th August 1969. The company grew to 55 staff, and daily output could sometimes reach 400 items of clothing in its heyday. The early seventies saw the rise of Dutch trade with the Far East. The first products ‘made in Taiwan’ began to appear on shop shelves and rainwear too was imported in bulk. The Dutch manufacturing industry took a major hit – especially in textiles – with the demand for ‘made in the Netherlands’ dropping dramatically. The entrepreneur Geert Dolfing was a tailor by trade, not a businessman, so was forced to trim down his company. He decided to close the facility in Kamerik and continue production in Druten with fewer staff. He realised that the technical know-how built up in high-frequency PVC welding over the years formed a major part of his capital; while his product was still rainwear, his specialism was the high-frequency welding of flexible plastics. This was partly why Dolfing Druten began to weld other plastics besides clothing over that period. A typical example would be the Bruynzeel plastic folding doors, which became extraordinarily popular in the seventies. The factory began to prosper again and the firm invested in an enormous new HF welding machine (the largest in Europe at the time). Geert’s son Peter joined the company in 1977, whose interest in electrical engineering was a perfect fit for the new direction. Besides rainwear and folding doors, Dolfing also began to manufacture plastic coatings for bus seating and the company continued to look for new customers needing products whose manufacture required the HF welding technique. 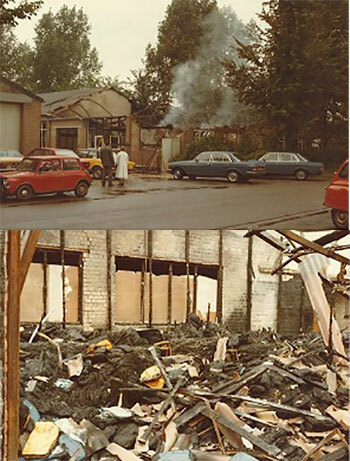 8th July 1980 is a date that Dolfing Druten will never forget; a fire destroyed two thirds of its factory in Druten. On 1st September 1980, eight weeks later, production was partially resumed in the surviving section, but it took months to get over the shock and consequences of the fire. The business began to lose traction, putting pressure on customer relationships, and the spirit of enterprise was under threat. In February 1981, Dolfing Sr. decided to cut back on staff and refocus on the company profile chosen in the seventies – this time with more confidence. Dolfing Druten was not just a rainwear manufacturer, but the brand of choice for watertight workwear too. The materials used were first-class, the after-sales service superb. Furthermore, the company could call upon an in-house treasure trove of knowledge and experience in high-frequency welding. Customers buying from our watertight clothing range would get real value for their money; every appeal to our capacity to innovate would result in amazement. It was quite reasonable to ask a premium for our more durable products. Since the eighties, innovation (research and development) has been part of our corporate culture as a matter of course. Dolfing Druten continued to set standards as a manufacturer of reliable watertight clothing for professionals, but – primarily on the initiative of Peter Dolfing’s new generation – the firm continued to seek out products requiring a great deal of know-how around HF welding and demanding the highest quality standards. Dolfing Druten produced its first waterbed in 1982. This action, more than any before it, bore out the business strategy of competing on quality, not quantity. By its very nature, a waterbed must be a high-quality product. They require the very highest standards of reliability and durability, and can only be manufactured through highly-skilled labour and delivered by an extraordinarily dependable supplier. A waterbed is not an impulse buy – consumers looking to purchase one will not be taking any chances. They will be investigating the market thoroughly. A major factor in the decision to purchase is the long-term guarantee and the after-sales quality – the customer will want to get to know the manufacturer. It was for precisely this reason that Dolfing Druten decided to focus on manufacturing products demanding such high quality during the eighties. Over the course of the nineties, the art of producing waterbeds came more and more into its own at the company. A new production hall was built and put to use, and major investments were made ultra-modern computer-aided cutting and welding equipment. Quality assurance for the production process was the next step, which saw a quality control system worked out for these products. Dolfing Druten began manufacturing waterbeds for a number of A-labels and also brought its own brand to market. Almost half of Dolfing Druten’s turnover was generated through the production of these synthetic, high-quality products, guaranteed to be watertight. Nevertheless, the firm was well aware that its continuity could not depend solely on innovation in its well-known products and current production processes, so it continued to seek out new products for new products. Dolfing was always ready to experiment, which led to the manufacture of e.g. folding roofs for the automotive industry. Hindsight has revealed that expanding from rainwear into waterbeds was a smart move, but it was not without its risks. Ultimately the risks the firm took turned out well – taking opportunities means taking risks and vice versa. Success is never guaranteed; that is the key to business. In the years since the Millennium, the first careful steps have been taken into the then-unknown Automotive & Shipping worlds. Special requests came in from shipping companies in the provinces to manufacture coverings for use at sea. New production processes were also implemented, leading to the manufacture of semi-finished car roofs in Druten since 2008. There has also been demand from the medical sector for high-frequency welded seams, which further led to initial work over this period on incontinence sheets, shower stretchers, mattresses and pillows for hospital use. Named after Geert Dolfing (1920), it was in 2013 that Geert Dolfing jr. (1982, son of Peter Dolfing) decided to join the company and continue the family business.